Mark came to prominence in the mid 1980s with the influential and radical big band Loose Tubes, with whom he toured and recorded until its demise in 1989. 1992 saw the emergence of one of Mark’s most important projects, the formation of Perfect Houseplants with whom he has recorded six albums. Other album releases include Through Rose-Coloured Glasses (Subtone Records) and Imaginary Dances (Staytuned Records, 2002), both recorded with his semi-orchestral 11-piece group the Scratch Band, three recordings with Seb Rochford's Mercury-nominated Polar Bear and his critically acclaimed 2005 recording Moving Air (Basho Records, 2005), featuring John Parricelli, Martin France and Mark's muti-tracked reeds. Mark has performed and recorded with an impressive array of international musicians and bands including Michael O'Sullebhain, John Parricelli, Django Bates' Delightful Precipice, June Tabor, Billy Jenkins, Stereolab, Jah Wobble, Robert Wyatt, Prefab Sprout, Don Um Romao, Thomas Dolby, Anja Garbarek and Radiohead. 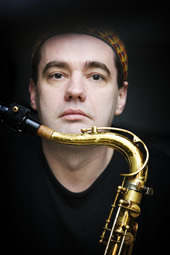 In 2007 Mark was featured soloist (along with John Pattitucci and Gwilym Simcock) in Mark Anthony Turnage's About Water which was premiered on the Southbank in June 2007 and this year Mark will be playing another Turnage piece, A Man Descending with the Southbank Sinfonia. Mark is also a successful commercial writer and session musician, much in demand for film and television work, past collaborations include projects with Mike Gibbs and the Oscar-winning composer Steven Warbeck. Mark currently teaches at Trinity College of Music, as well as occasional teaching and master classes at the Royal Academy of Music. Current projects include the Mark Lockheart Group (a new band with Liam Noble, Jasper Hoiby, Dave Smith and Dave Priseman, -CD to be released late 2008) Polar Bear, Perfect Houseplants, and Robert Wyatt's Soup Songs.